We’re using chimichurri as a sauce, come dressing, for a beautiful piece of cooked and cooled salmon. You can roast or poach the salmon but what we like to do is roast the salmon with some of the chimichurri over it to really get the flavours working, adding the rest later on. If you want to make this recipe even easier than it already is, when it comes to the puy lentils, buy yourself a packet of cooked puy lentils, they come in pouches and are really good!! Other than the main players of salmon, chimichurri and puy lentils there’s lots of other tasty morsels in there but the other key one is feta cheese, but if you’re not a fan of feta cheese you could always use something else, goats cheese is another that works really well in this recipe. Blitz together everything in a food processor or by hand in a pestle and mortar. Brush each fillet of salmon with a small amount of the chimichurri sauce and cook in the oven for 10 minutes at 190’c then allow to cool. In a pan, soften the red onion in the olive oil. Add the garlic cloves and fry for 1 minute. Add the Puy lentils, cover with the hot vegetable stock, bring to the boil and simmer until tender. Drain, then stir in the feta, sunblushed tomatoes, parsley, coriander and the lemon zest. 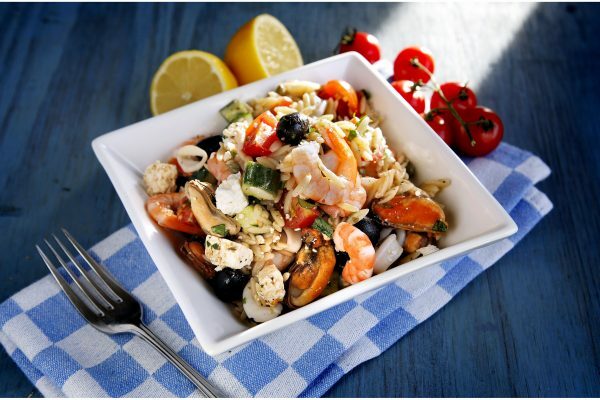 Season with salt and pepper, add the lemon juice and drizzle with extra-virgin olive oil. 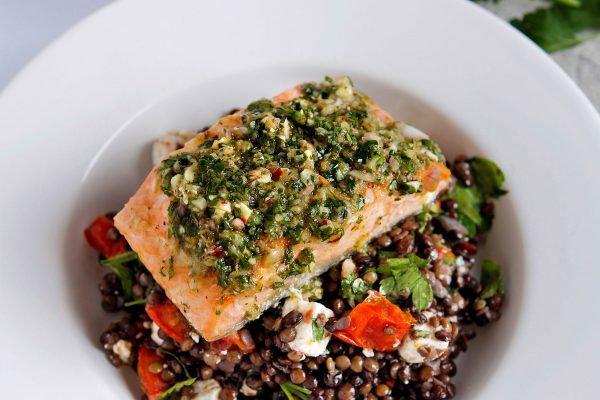 Serve the salmon on top of the lentil and feta salad and top with the remaining chimichurri sauce. Enjoy! As well as being a natural partner for steak, as so perfectly demonstrated by the Argentinians, Chimichurri is actually fantastic with most things. 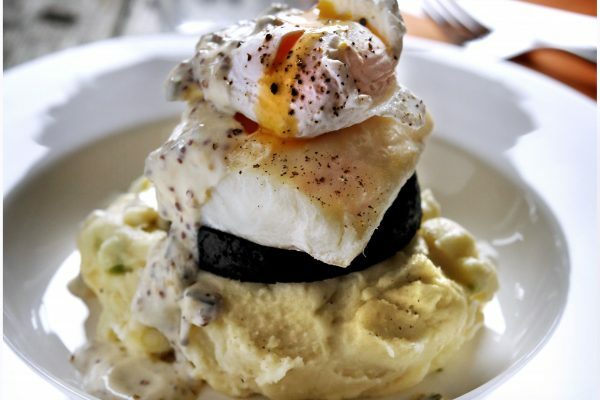 It goes swimmingly with white fish but if you’re not a fan of fish, then why not try it with a bit of chicken. Chicken can be a bit bland so chimichurri is actually the perfect partner for it, bringing to life something that people can find a wee but boring sometimes. Treat the chicken exactly like the salmon but give it an extra 10 minutes in the oven, amazing! 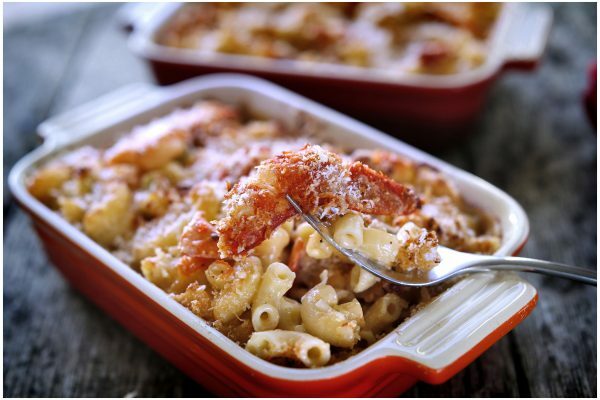 Macaroni cheese is possibly the ultimate comfort food, and this dish is no exception to that rule but with a little bit of a twist by adding lobster.